Honest confession, I decided to read Flat-Out Love when I kept hearing people tweet about Flat-Out Matt. I wasn't sure what Flat-Out Matt was about but I did figure out I would need to read the other book first. As soon as I finished Flat-Out Love I immediately purchased and read in one sitting this fabulous novella. If you haven't read both of these stories yet, then I suggest you immediately go purchase them and start reading! I can promise this is going to be a story unlike anything you've read before and you're going to surprise yourself when you fall for geeky romantic Matty. 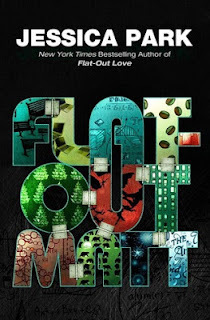 In Flat-Out Love you see, experience and fall in love with Matt through Julie's eyes, however in Flat-Out Matt you get a deeper look into Matty's mind and heart during some of the most pivotal chapers of Flat-Out Love. As a bonus Jessica Park has gifted us with a couple of pre-Julie chapters and one seriously hot and steamy post Flat-Out Love scene. Who knew geeky boys could be so incredibly hot! Those two things alone are enough for me to recommend you buy and experience this book.